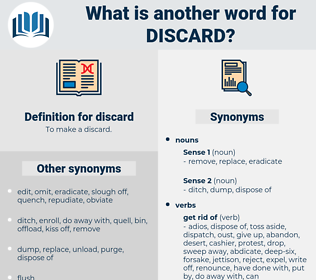 What is another word for discard? Rejections, refusals, suckers, sprouts, spills, exhausts, stools, shoots, OUTS, dismissals, outflows. lay, disregard, eliminate, Eliminating, jettison, renounce, dispose, exclude, remove, relinquish, dispel, ignore, discontinue, eradicate, dispense, forego, waive, forgo, surrender, repudiate, preclude, avoid, leave, refuse, delete, cast, divest, quit, displace, ditch, shun, undo, avert, toss, abolish, abdicate. abandon, disallow, forsake, dismiss, throw, disqualify, scrap. assert, claim, cherish, maintain, advocate, vindicate, proclaim, acknowledge, avow, defend, own. ratify, hold, retain, take in, welcome, keep, admit, save, accept, allow, sanction, uphold, choose, approve, embrace. Discard, I beseech you, ideas so degrading to true love. I cannot, therefore, discard so old and faithful a friend without deep regret, especially when I reflect that, stung by my ingratitude, he may desert me for ever! 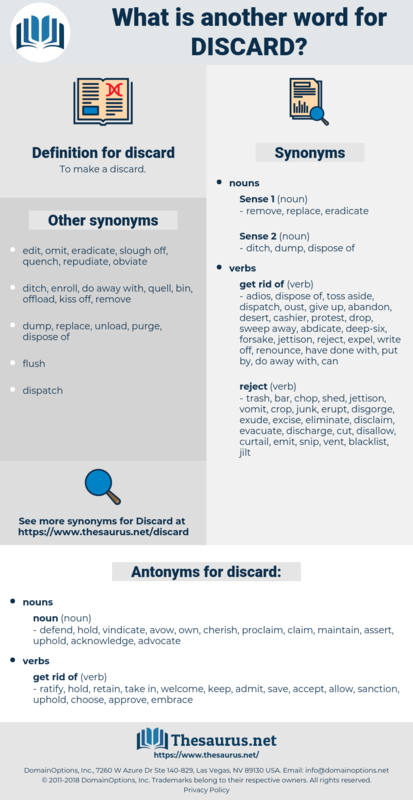 degraded, Daucus Carota, decorated, desecrate, dockyard, decorate, desert, dose rate, discreet, decreed, degree day, discord, deserted, degrade, disagree with, discrete, ditch reed, disarrayed, dasyurid, desired, disaccharide, discredit, discarded, dog-eared, disaccord, dessert, desecrated, dissertate, dogcart, desegrated, discredited, djakarta, dasyuridae.